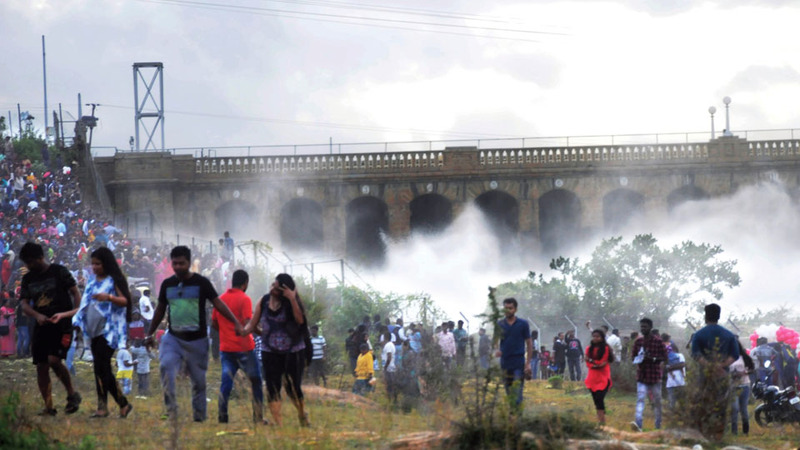 Mysuru: Entry of visitors to Brindavan Gardens at Krishna Raja Sagar (KRS) Dam has been banned and tourist entry to the Dam and its downstream near Srirangapatna in Mandya District has been restricted from yesterday, in spite of tourists coming in thousands to witness the spectacular sight of water gushing out of the many crest gates of the Dam that have been opened. The musical fountain has been discontinued until further notice and it will be restored only after the water level recedes. While there is a complete ban on tourist entry into Brindavan Gardens, visitors are barred from entering via the North Gate of the KRS (from the old entrance to Brindavan Gardens). Visitors are only allowed to view the water discharge by standing along the railings near the water department office. Over 20 crest gates of the KRS have been opened from which 71,581 cusecs of water is being released into the Cauvery river today. Last evening, the outflow level was augmented to 73,159 cusecs as the inflow rose to 51,679 cusecs. The water level in the reservoir this morning stood at 123.05 feet. Speaking to Star of Mysore this morning, Cauvery Neeravari Nigam Limited (CNNL) Executive Engineer K. Basavarajegowda said that the entry to the KRS will be banned till the outflow touches 50,000 cusecs. “We have been receiving an average inflow of 50,000 cusecs daily. We are forced to ban tourist entry through the North Gate. Thousands of tourists are coming to see the water release near the CNNL office (near the new bridge and toll gate) and controlling the crowd is becoming a problem,” he said. Basavarajegowda said that the ban is likely be in force till at least a week or so. “It will all depend on rain in Kodagu. If the inflow continues to be at the present rate, we will continue the ban,” he said. On the North Bank Road, barricades have been set up and the Police are guarding them to prevent tourist entry. Policemen are cautioning the visitors against leaning precariously on the compound and meshed fencing of the reservoir. However, the ban on entry had little effect on the tourists as visitors navigated their way to catch a glimpse of the water flowing out of the crest gates by taking the dirt track alongside a canal emerging from the river. At Ranganathittu Bird Sanctuary, boating has been closed since yesterday and the entry to the sanctuary has been limited to Dr. Salim Ali Interpretation Centre, said Deputy Conservator of Forests (DCF) Mysuru Wildlife Siddaramappa Chalkapure. “Losses to the island can be assessed only after the waters recede,” he added. Meanwhile, reports from Kerala said that there is a revival of South West Monsoon and heavy to very heavy rains are lashing the coastal State. The revival of monsoon means it will further rain in Kodagu, increasing the flow into River Cauvery. Meteorological Centre in Thiruvananthapuram said that the State has been receiving about 11 percent more rain than the normal average. The forecast of heavy to heavy rainfall has been extended till Thursday (July 19). Water inflow to Kabini Dam in H.D. Kote is likely to rise as heavy rain is predicted in Wayanad district of Kerala that is a catchment area for the Dam. Yesterday, the combined water release from the KRS and Kabini Dams was more than 1 lakh cusecs.